Fin (scared): Mom! Get Dad! Mom (concerned): What is it Finny? Something in the bathroom got you spooked? Mom (chuckling): Oh sweetie, did you drop one of your mice in the shower again? (smugly) I think I can take care of that without your Dad. Fin & Mom (yelling): DAAAADDDDD! Mom (scooping Fin into her arms for protection): Thank Cod you didn't use the Paw Of Doom on that thing! All it needs is a saddle and you could ride around on it. Oh my Cod, is it moving? DAD! Dad (worried at all the yelling): What's wrong?! Mom: Look in the shower! It's the biggest bug ever!! Dad (horrified): Holy [expletive deleted]! Did Fin kill it? Mom: No! It's too big for Finny! You need to kill it! Dad: Sure I'll kill it, but look at her wriggling. I think she wants her turn at it. Fin: No Dad, I'm good. I wanted to hang out under the bed till you're done here. Hey how do you think it got in here? Mom (shuddering): I don't know?!! My great friend, the handsome mancat Misha, is in the final running to win New Zealand's Next Top Cat Model. He needs all the votes he can get, because you can only vote once per email address. We have used all the email addresses we can think of here... but maybe you have one you could use? Here is a picture of him, isn't he handsome? Plus he is an awesome cat in other ways too. He is friendly, funny, and lovable. He's the best sportsman in any contest. So please help support my friend if you can. 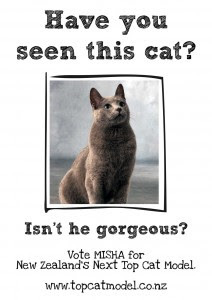 Click Here to vote in the contest, and MISHA is the name to vote for friends! You may have heard that I sent a letter to Mr. Sun last week, regarding his lack of timeliness in showing up every morning. His showing up late has completely thrown off my morning feeding schedule. It's almost impossible to get Mom out of bed when it's still dark. I was quite surprised this weekend when he approached me and we had a nice little conversation while I was on the porch. Poor fellow, seems he feels a little put upon, you know, with the whole global warming thing. He explained about how busy he's been on the other side of the world. He even mentioned how extra hard he'd worked during the summer, here in the desert (I told him he didn't need to work that hard). After a little digging, he started to tell me the real story. He complained that Ms. Cloud sometimes hogs the sky and steals his thunder - oh and that funny bit he does on Thunder had me nearly hysterical. Eventually he got around to telling me about a certain "Diva" who was interrupting his work. I think we both know who that is, don't we. He was careful not to name any names, but I'm not blind. I couldn't help but notice that some nights you barely make an effort. New Moon? More like No Moon I say. So if you are going to hog the spotlight, the least you can do is show up! Mom is pretty slow-witted in the morning, so if you shine in our bedroom window she might think it was time to wake up. I bet I could get my breakfast before she even figured it out. Let's work together on this - one diva helping out another. Yes, I hear you, and no I won't look! Mom has been really busy all week, and has barely been able to keep up with reading all your news much less comment. Boy I hope this slacking off ends soon! I'd hate to have to let her go. Nah I'm kidding, she's not purrfect but she is all mine. Mom is a little anxious because we are waiting to hear back from the book publisher to see if they will accept my book or not. So if you could maybe give a quick little purr it would be really nice. Have a great weekend Friends. I'm headed out for a slumber party! I hated to bring it up, but I couldn't help but notice you are showing up for work a little later each morning. I don't mind you taking it easy now and again, but this slipshod performance is cutting into my breakfast time. You see, I am used to you showing up around 5am, I cut back a half hour (approximately) and use that as my Mom wake up time. When you roll into work, what almost an hour late these days, Mom is unwilling to get up to feed me. My belly says it's time! I don't really care if you're on time or not, but Mom does. So if you need a little "Me Time" I have no problem if you wanna kick off early, but let's pull it together in the morning. Maybe you could lay out your outfit, or pack your lunch the night before? Yep it's 300 posts that have appeared here at Housecat Confidential - and from the tips of my paws, I want thank all of you for making it so much fun for Mom and me. Blogging has brought us awesome friends and lots of laughs. We hope that we have brought all of you the same. I asked Mom if we could do a little something for kitties in need to celebrate. "Her Cheapness" agreed and is going to donate some green papers to Homeward Bound Cat Adoptions, a local charity. If you have any spare green papers, they do a great job helping kitties find homes. Mom had been looking into local kitty charities recently and discovered Homeward Bound at Petsmart. I suspect that she discovered them when she was recently busy snuggling kittens there. Initially this post was conceived to help them rebuild, after an unkind person stole their donations from an adoption fair. Mom and I felt awful about it, when we heard the story on the news. The story had a happy ending though. Very kind people stepped up and replaced the stolen funds. I don't need to tell any of you, but "Fur People" are very good people indeed. So curl up with your humans and know you are very lucky indeed friends. Catwalk Tweet as a Pirate! I think I got it all in! It's a big day today. 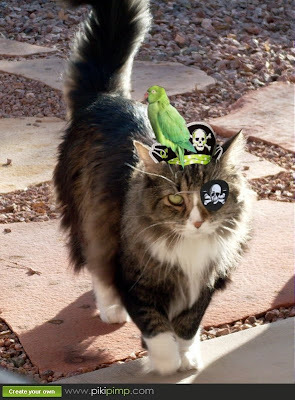 I'm strutting my stuff for Misha on Caturday Catwalk, with a parrot for Tweet Week, all while shivering yer timbers for Meow Like a Pirate Day. 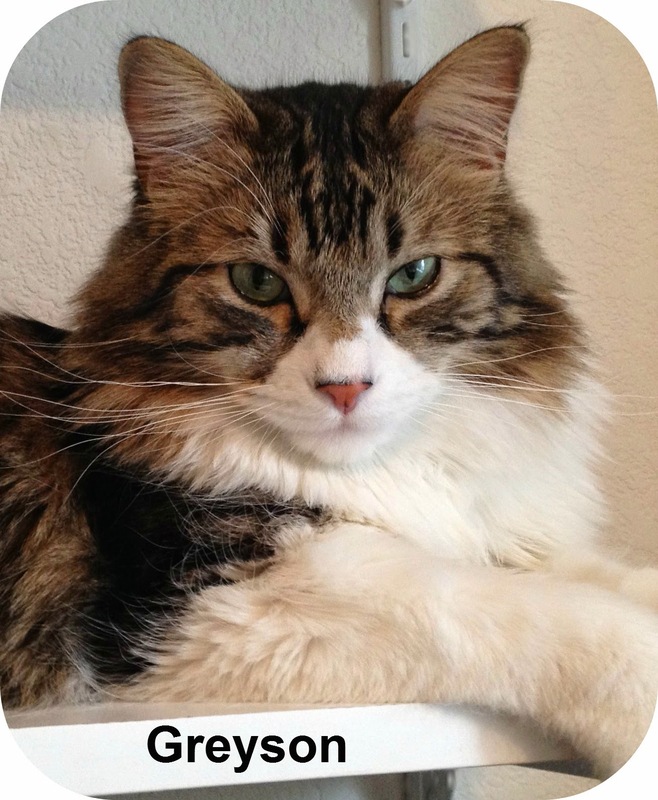 I'm heading over to make a donation at Misha's place, which will help him win a top cat model prize. He is gorgeous and should totally win! Wow! I'm spent! I think I'll take Monday off too! I need to think of something special for next week, it's gonna be my 300th post soon! Have a great weekend friends! Well Tweet Week is almost over. I've sure had fun, and I hope you had fun too. Thanks to all you cool cats who played along too. I've got another "Week" planned too, maybe for October, stay tuned. So I thought I'd round things out on Floofy Friday with some Fatberd action shots. Take that, sassy Hummingbirds, rude Mockingbirds, and snickering Finches. The Queen of the Porch is back on the prowl. P.S. 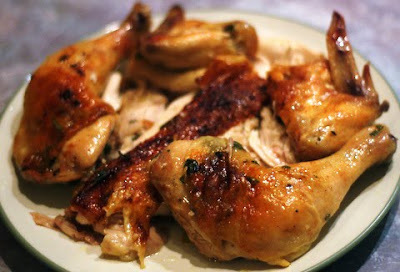 The "After" shot from yesterday did look yummy (sorry to my vegetarian readers) so I here is the link on how to make Herb Chick-Hen. I hope Mom makes it happen this weekend. As I've mentioned, my parents are fairly clueless when it comes to bird names. At my request the other day, they propped me up on the wall in the yard for a little peak into the world beyond. I wanted to see what was causing some of the noise I hear sometimes. Well it's been a long hot summer, and while it's true that I've been absent from my porch, I'm still Queen of the Porch and all tweets should know this. Right? Yet I found myself having to raise my voice to get everyone in line this weekend. Here I am telling the Doves, what for! When some brazen little Hummingbird (Yes a HUMMINGBIRD!) flew right up and sassed me to my face. 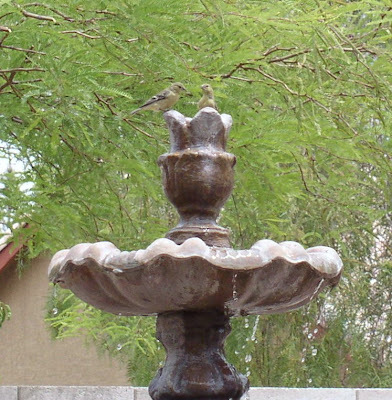 It then cut in front of the finches, for a sip in MY fountain. I was so shocked that I failed to smite it down with my Paw Of Doom. Next thing I knew, I thought I heard the finches snicker! This is unacceptable friends... I need to take back the porch! I've long suspected that my parents don't know everything. One area that I suspect they're close to clueless is in what to call the varieties of birds that live here in the desert. I think they have the big ones down - Doves, Pigeons, Sparrows, Mocking Birds, Hummingbirds and Crows. I'll even give them credit for recognizing Road Runners, although I've never seen one in person. Here is where things start to break down. Any small bird, that is not a Sparrow or a Hummingbird, is called a Finch. Still I trusted them. 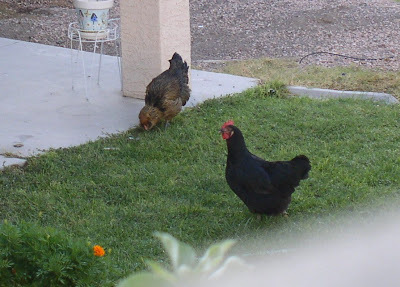 When they called the less than attractive medium-sized brown bird a Nevada Brown Bird - I began to doubt them. I still believe Dad saw a "Monster Pigeon" (big as a small dog) even when Mom says it with a snicker. I will also go with his claims that he sees a Falcon sometimes. When we saw a lovely sparrow-sized bird that had a yellow face which turned orange and eventually red on his chest, I had my doubts that it's real name was a Tequila Sunrise, but I let it go. I had no real proof. Then the other day we saw a little Finch-sized tasty, er pretty, looking little bird. He was a bright chartreuse with a black face and black wings. When Daddy called him a Wilson, named after his resemblance to a tennis ball - well, I knew they were clueless for sure. Dad went to the mailbox and returned while Mom was... indisposed. 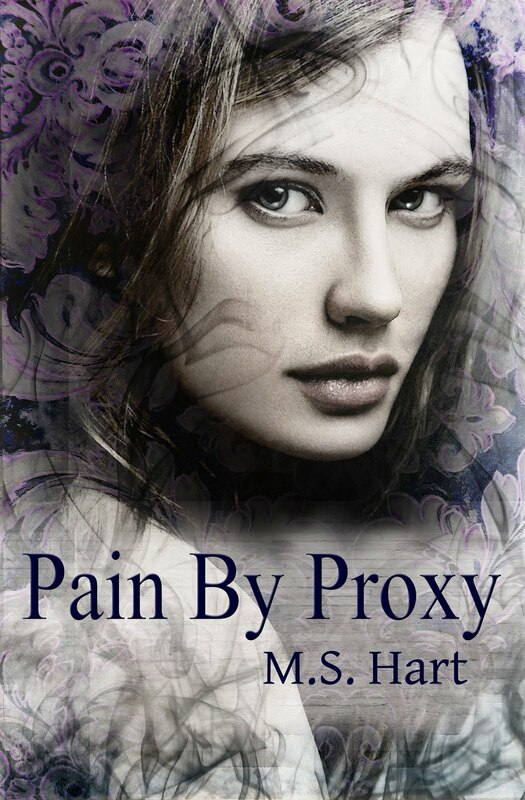 He yelled out that a package had arrived for ME. I was so surprised, first a paw it forward and now this! "It's a surprise for Toontzy. It's gonna be for Tweet Week." Mom yelled from her perch. "Meow! Open it Dad! Do It!" "I'm gonna open it!" Dad yelled to Mom. "No! Not yet, I wanna take photos!" Mom yelled which only I heard, and naturally choose to ignore. "Do it Dad!" I mewed loudly as Dad got busy cutting into the package. I held my breath as I waited to see if my birdy dreams had come true. I made sure that I continued my loud meows, to cover Mom's continued yells to leave it alone. "Oh this is really cute! It's this blue bird." Dad yelled out to her. "No! I said don't open it! Don't give it to her yet!" "Oh she loves it! She's rubbin it all over her face.... Now she's kickin it's a-"
"No!" Mom said as she came into the kitchen, just in time to see me finish some darling bunny-kicking business. "Shoot! Did you not hear me when I said not to open or give it to her?" "What? No. I thought you said TO open it." Yep friends, a whole week devoted to our feathered prey, er friends. So if you want to play just let me know in comments. No rules, so anything you want to post is great. If you want to take this little badge you're welcome to it (but don't feel obligated - Mom made it herself with clip art). Now, on with the Floof! I know you need your fix before the weekend. Yeah, that's better now, isn't it? 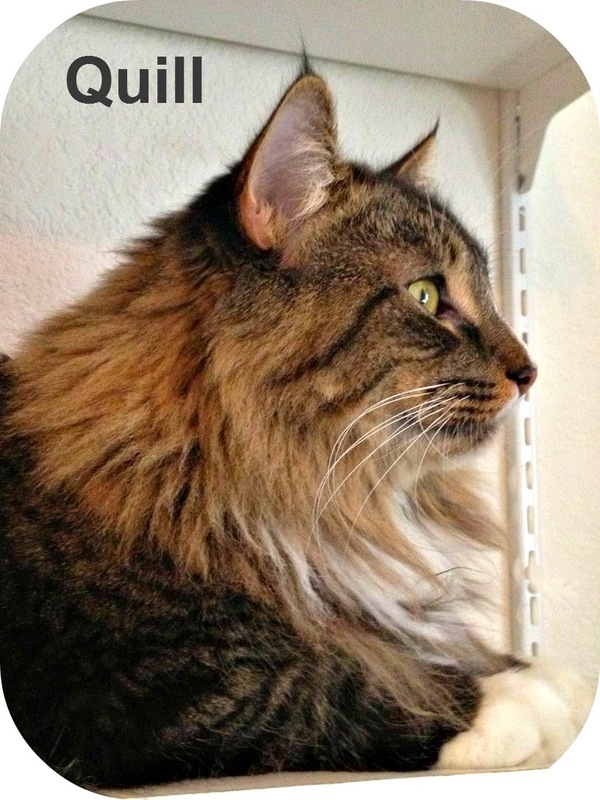 I'm not going to promise anything but - if Mom can figure out something fun - we may post for Caterday Catwalk too. P.S. Mom nearly had a heart attack - the laptop wouldn't come on! Dad suggested she plug it into the wall and it worked (did I mention she troubleshoots laptop issues for nurses everyday?). She is still freaked out, and posting Friday very early. Mom, open up the feather swing toy! Wait! Is that what I think it is? Yes it is!! It's a Kong Kickeroo! I have wanted one of these little fellas for awhile! Look how nice it goes with my fur! Oh boy! When you're done bunny-kicking it, it makes a nice chin rest for naps. The nip level is just right, revs you up to kill, and then mellows you for a nice nap. I love it! PS. I will be making an announcement tomorrow about next week's posts. I have something fun planned and you can play too! Oh boy friends, I've been Pawed Forward! My great friends over at Wendy's 3-D Cats have outdone themselves. I can't thank them enough for their friendship and generosity! Look at this haul! What's in here? A sweet card from my friends, Wendy herself, the very handsome Dante, his handsome brother Dylan, and the lovely Domino (the card even looks like them as kittens!). TWO kinds of treats, yummy Salmon and Liver, and cat nip leaves (premium! I can't wait to roll in those later). Look at these chew toys! Love these! I actually carried these, in the package, to the coffee table. I couldn't wait for Dad to cut them free. Wait is that a Honeysuckle Octopus? Oh yes it is! I'm spent, I need to save the rest for tomorrow! The exchange focuses on doing an act of kindness without expecting anything in return other than that the recipient will, in their turn, pass the kindness along and 'paw it forward' in their own way. This is how it works...I am going to send something to the first blog owner who wants to take part. In turn you will then post about this on your blog, link back to me, then send something to the first person who signs up to play along through your blog. There are no cost restraints, BUT don't go crazy! The little something you send can be something you made, bought, were given or found. No biggie, just a gift that will make the person smile; maybe something unique from where you live? And, remember that kindness does not have to involve money, there are untold ways to help others every single day, everywhere you go- just look around. Please post a comment letting me know that you want to play! What a nice idea, right? So who would like to be pawed by me? Fin (jumping on to bathroom counter): Whatcha doing now Mom? Mom: Well, I just exfoliated, and now I'm going to pluck my eyebrows. Fin (awakened by chin scritches, given with freshly shaped nails): Oh yes Mom, those are nice now. (Fin looks up to see a green-faced stranger hanging over her, frightened she jumps from her sink and runs under the bed). WHAT HAVE YOU DONE WITH MY MOTHER!! Mom: Fin, come out from under there! It's me, Mom. See, it's just a facial mask. Fin (crawling out from under the bed): Sorry, but it was really scary. (chuckles) Remember the times you were allergic to your masks and you broke out in hives? Wait, you did an allergy test first right? Mom (looking confused and less than confident) Allergy tests are for wimps... besides I would have thrown those out... right? (tilting head to side) I think I'll wash it off now. Fin (jumping back on the counter to assist while Mom washes and dries her face): All done now? Cause I'm spent here. Fin (paws going to mouth in horror): NO! Remember when you looked like an orange zebra? Mom: Oh I would have thrown that brand out, I think. Here we are. Let's see - Exfoliate first, check, patch test? Patch tests are for wimps! Fin (jumping from sink and running down the hall): I'M GETTING DAD! Three-day weekends can be very dangerous friends. I'm so glad she's gone back to work or she might have had ideas about a salon day for me. Fin (jumping onto the bathroom counter): Hey Mom, whatcha doing? Mom (mixing a bottle of dye): Oh, I'm dyeing my hair. Careful up here. Fin: Are you sure that's a good idea? Remember the time you got blond highlights and you looked like a skunk? Mom: Hey, that was the salon that did that. Fin: But you thought it looked okay, till you got home. Remember when you got it dyed the color of carrots right before you left on a trip, and had to wait till you got home to have it fixed. Everyone called you "Le Carrot" on the trip (chuckles)... (Grows concerned as she watches Mom slather goop on her head) Maybe I should get Dad? Mom: No it's fine. I've done this myself before. Now move along, or I may turn your grays blond. Fin: Did you do the strand test? The allergy test? Mom: No! The "strand test" is for wimps. I've done this before you know. Fin: Is your hair supposed to be green when you're done? Fin: No reason... (crinkles nose) What stinks? (sniffs in Mom's direction). I think I'll wait in the other room. Cut to Fin and Dad sitting on the couch watching TV. Mom strolls in flipping her hair saucily. Fin squints to see if there is any change - there is none - but she raises her paw in a thumbless-up affirmation for encouragement. Mom: Why do I bother? Hi friends, I hope your Labor Day Weekend is free of laboring. In keeping with my bitey post from yesterday, my great friend Huffle Mawson first posted this fun meme and invited anycat to play so I thought I would play. It's the "Oops I Ate It" award and 'when accepting this award you must blog about the food you have stolen when your humans weren't watching. If you have never stolen any food, you must be a very good pup or kitty. You can accept this yummy tray of cookies as your reward!!! Next add the logo of this award to your blog (optional)." 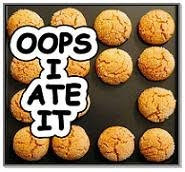 I don't know if "oops" is appropriate, because I always steal with steely determination. I admit that I enjoy a little human food now and then. I usually get my scraps the polite way - by requesting them while my parents enjoy their dinner. I make my figure eights through their legs and mewl politely (hey, does this count as grooming if Mom has excessive stubble? but I digress). However if things are left too long on the coffee table... well... I may not be so civilized... as evidenced here. Oh and water and milk cups don't count right? Anyone else wanna come clean? P.S. It's Daddy's birthday today and I am hoping for another lick of whipped cream and milk. A ladycat can dream! P.P.S. Mom claims she will be busy this weekend with B-Day activities so she may be comment less. HOUSECAT CONFIDENTIAL, the book. Fin's tell-all glimpse into her life as a suburban housecat. 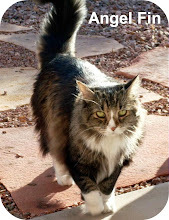 Angel Fin has passed the blogging torch to the two new kitty residents at the H.C. Hope you enjoy the new adventures.